She is also a huge fan and advocate of steampunk. For the past 5 years, she has been working on a new young adult series The Skylark Saga. The first in the series is The Skylark's Song. In this first installment we meet a few of the main characters including Robin (aka Skylark), a brilliant flight mechanic, who must quickly learn to be a pilot when her country's situation becomes dire in their war against the Klonn. She must learn to fly and fight against their best pilot known only as the Coyote. He is ruthless and deadly, but he also seems to have feelings for Robin. Can she learn to trust him and accept his offer of freedom and romance for repairing a mysterious device. Frey has done a great job of introducing the reader to her characters, and setting the stage for Skylark's upcoming adventures in her attempt to stop a war that's gone on far too long. The world she has created is very rich with 3 different cultures intertwinning and backdrops of factory, town, and country. The ending leaves you wanting more. There are so many questions and mysteries yet to be answered. You don't have to be a young adult to enjoy The Skylark's Song. I recommend it to everyone from 12 to 92. It’s a victorian horror steampunk extravaganza about three asylum patients trying to escape the clutches of the corrupt and sociopathic director. Abused, humiliated and subjected to horrific illegal experiments, our three anti heroes will have to dive deep within the bowels of the labyrinthine asylum if they want to keep their brain whole. The whole project is illustrated, inked and colored by none other than Montreal's own Jeik Dion the artist behind the Turbo Kid comic book. Both dark and colourful, brutal and hilarious, the Saint-Iscariote graphic novel will drag you kicking and screaming in the Jardin Mécanique universe until you can only ask for more. The graphic novel will be availabe in French or English, and the artist's work fits their story perfectly! Get on board and get yourself not only the graphic novel, but also all the other amazing backer goodies to be had! About this time last year, I had the pleasure to review the first in his series, The Boy in The Clockwork Cage. 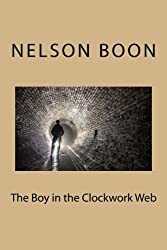 His new book The Boy in the Clockwork Web continues the story a few years later. Alonzo is now a grown young man. He has become head mechanic and inventor for a thriving company. Gus too has found success and his place in a modest way, and both are quite happy. But then Alonzo finds Tommy. A polio stricken street urchin that he feels compelled to help. He finds Tommy a place with Mrs. Browne who now works for a new family. Alonzo hopes Tommy can learn and become more than just another dirty street arab. But Tommy is not like Alonzo. He is much harder and calculating, and he is belligerent and cold. Everything Alonzo never was. Even Mrs. Browne has an impossible task in winning him over. But Alonzo has one more trick up his sleeve. In his spare time he's been working to resurrect the infamous device that he had once hoped would make him whole again. It's his last attempt to win over Tommy. But a sinister business man also has a great interest in his device, and when he finds the mad Dr. Cheyne, things turn very dangerous for Alonzo and Tommy. Nelson Boon has created a wonderful continuation of Alonzo's story. He has added more dimensions to his Victorian vision, and the new characters fit in well. The story is a seamless natural continuation even though set a few years later. Although this series is wonderful for anyone to read, in particular it reminds me of the old boys adventure books. There is danger and adventure, gadgets and friends. If you're looking for gifts, this series would be wonderful for any age group from about 10 years old and up. I said it in my review of his first novel, and I'll say it again. I highly recommend this series. 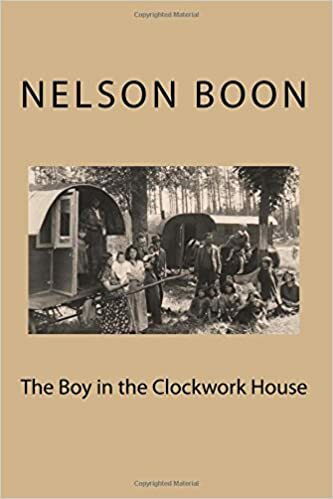 Nelson Boon has once again brought to life the gritty, hard side of Victorian life, with dashes of steampunk and hope. In Victorian London, the fates of physician Simon Bell and apothecary Gaelan Erceldoune entwine when Simon gives his wife an elixir created by Gaelan from an ancient manuscript. When it kills her, Simon becomes suicidal and swallows the remainder, only to find he cannot die. Five years later, hearing rumors of a Bedlam inmate with regenerative powers like his own, Simon is shocked to discover it’s Gaelan. The two men conceal their immortality, and the only hope of reversing their condition rests with Gaelan’s missing manuscript. When modern-day pharmaceutical company Genomics unearths diaries describing the torture of an unnamed Bedlam inmate with regenerative powers, the company’s scientists suspect a link with Gaelan after a fatal accident doesn't kill him. Gaelan and Genomics geneticist Anne Shawe become powerfully drawn to each other, and her family connection to his manuscript leads to a stunning revelation. This thriller does a fine job of switching between the two time periods to give the reader both Gaelan's and Simon's full stories. Gaelan's is even more intricate and older than the reader is first lead to believe, it makes him a much more interesting character. The author also does a good job of describing Gaelen's flashbacks and nightmares from his time being tortured at Bedlam. It was so bad, that he is still affected hundreds of years later. And Simon has his own demons to deal with. Well actually his dead wife. Her ghost haunts him into the present. But is she angry because he killed her or is it his own guilt and longing for her that keeps her near him, screaming and taunting him to find a way to bring about his death? And did I mention there's a wee bit of myth and magic too. But only a little. Most of the book is based on scientific principles and it's quite fascinating on its own, but the magic brings the past and present together and takes the tale on a sharp left turn. It's a well conceived tale of two men and their search for release from an accidental condition that's been nothing but trouble and mental anguish. With the addition of some science, some myth, and some mystery, Barbara Barnett has created a wonderful new narrative. I recommend The Apothecary's Curse. You can get a copy when it goes on sale October 11th. This time around he's got something new that will turn any steampunk, or otherwise, into a maker. Check out his new Kickstarter campaign for The Volt. This campaign aims to establish several signature models of "The Volt" clock, produce the first large sale production run of units and establish a web-based communication portal that helps users share their modifications to the base design. Additionally, they will be donating 5% of profits raised to the Nanaimo Makerspace in Nanaimo, BC. There is still time to get involved. Make your very own Volt Clock! "At the end of the 19th century the eccentric Canadian inventor Thaddeus Barnes buried six copper cylinders across Canada. The locations of those cylinders he encoded in a private journal. That journal was filled with riddles, ciphers, mathematical puzzles and word games. His intention was that the most worthy of his three children would solve his vexing challenges, discover the cylinders and retrieve the six pieces of a brass key which would unlock a hidden safe that contained details of his greatest inventions, and his fortune. But, upon his mysterious death, his children sailed to Canada from England on a astounding ship, the Titanic. His journal remained forgotten in the Canadian Archives. Until now." Come this fall Canadians will be able to enter the world of Thaddeus Barnes, his inventions and his journal. Each week starting in August HarrowsmithNow will reveal a new page of the Barnes journal. Each will lead to a new copper cylinder until the safe is discovered and a prize awarded. 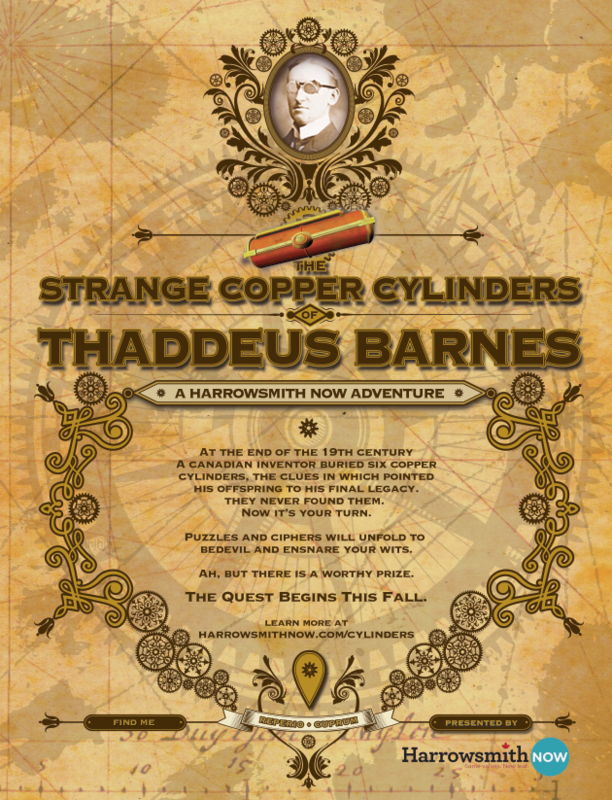 They call the adventure The Strange Copper Cylinders of Thaddeus Barnes. But the tale goes deeper. Each week they will also release a new episode of a gripping radio drama called The Strange Wax Cylinders of Thaddeus Barnes. In it a younger Barnes, his brilliant daughter Philipa, and his fellow inventive genius, Nikola Tesla battle the deadly Black Hand and an elusive enemy bent on stealing the secret of Barnes’ greatest invention, the electron compressor. At their website, you can request a notification when it begins. Have fun! Special guests include Abney Park, and Frenchy & The Punk. There will also be interactive exhibitions, panels, workshops, variety entertainment, buskers, teapot racing, and much much more! The event is currently looking for more buskers and workshop/panels. If interested, click on the links and get involved in the biggest steampunk event in Canada. To keep up to date on tickets and programming, be sure to check out the GCSE website.